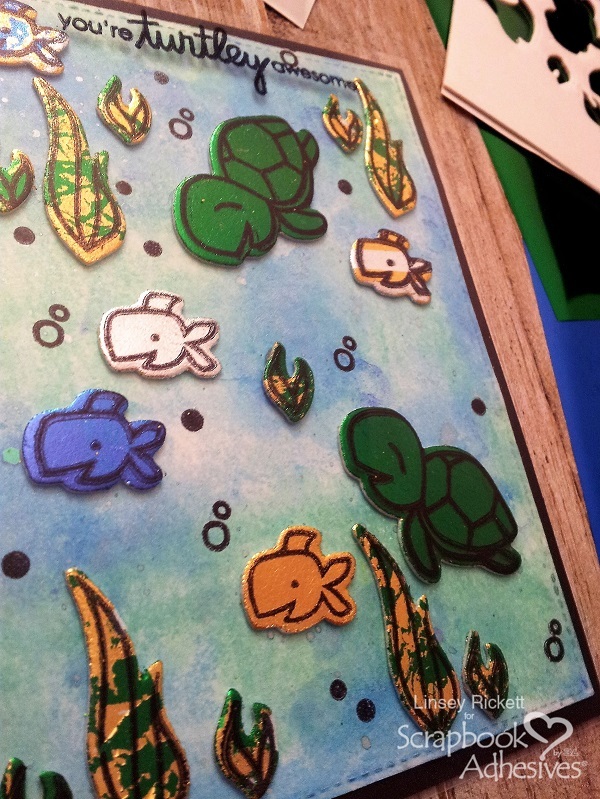 Making sea creatures come to life with 3D Foam Creative Sheets and foil is a whale of a good time! 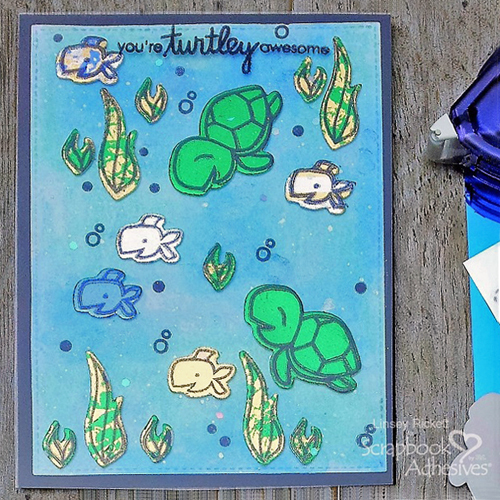 Hello there, Linsey here today sharing a colorful under the sea card featuring the 3D Foam Creative Embellishment Kit. The background was created using mixed media techniques. First, cut a white cardstock card panel to size and prep with a layer of gesso. Once dry, apply shades of blue and green Gelatos and spritz with water to activate the color. Create as much depth as desired by moving the color around on the cardstock panel while wet. Using a heat gun in random spots to pool. Dip a paintbrush tip into silver ink spray bottle and flick lightly with the tip facing the panel several times to create a shimmering reflective light effect in the water. 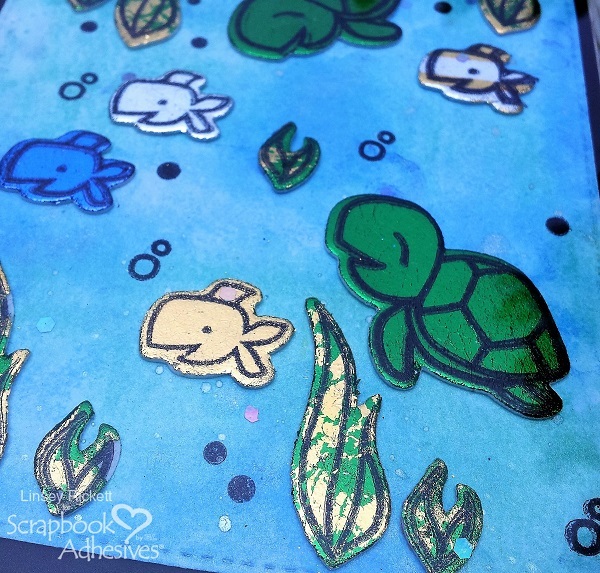 Using the 3D Foam Creative Embellishment Kit, die-cut turtle, fish, and seaweed shapes several times each from 3D Foam Creative Sheet. Create the desired scene by arranging the die cut shapes on the panel before removing the backings. Once decided, adhere them permanently to the base. Begin applying foils to each piece individually by removing the top liner and applying different colored foils (touch the foil to the exposed adhesive with the colorful side facing up). A couple different ways to do this is by applying 1 solid color to a shape or 2 or more colors to a single shape, as was done on the seaweed plants. Have fun experimenting with the 3D Foam Creative Embellishment Kit and discover different ways to use foils to shapes! 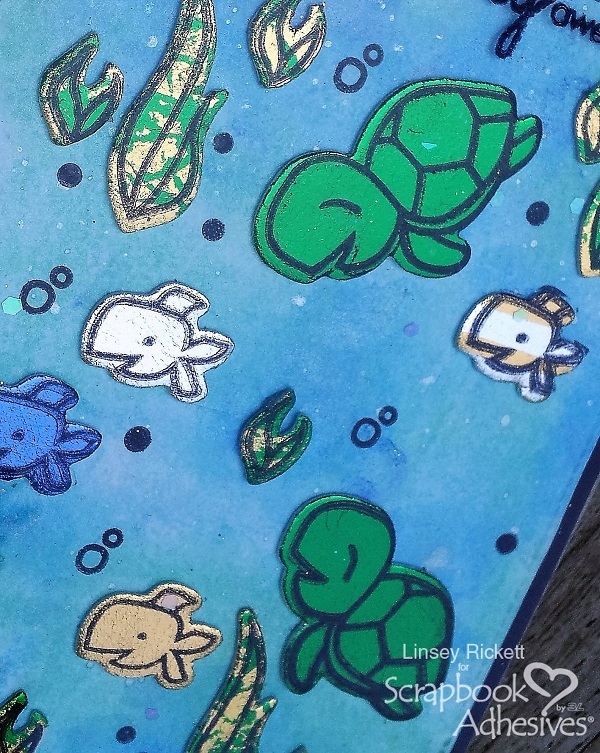 Finish card by stamping coordinating images over the foiled shapes with black permanent ink. If desired, add a stamped sentiment. Adhere underwater panel to the card base with E-Z Runner® Grand Refillable Dispenser. For interest, a clear plastic window sheet was applied over the entire front of the card with a bit of E-Z Runner® Permanent Fine Adhesive Dispenser. Thanks so much for stopping by today! Create with 3D Foam Creative Embellishment Kit and share your beautiful art with us! Until next time, happy crafting! This entry was posted in 3D Foam Creative Sheets, 3D Foam Squares, Adhesives, Cards, Crafts & Tutorials, E-Z Runner® Dispensers, E-Z Runner® Grand, Intermediate, Mixed Media, Permanent Adhesive, Seasonal Craft Ideas, Skill Level, Summer, Wear your Adhesive on the Outside and tagged 3D Foam Creative Embellishment Kit with Foil, 3D Foam Creative Sheets Mix, 3D Foam Creative Sheets White Small, Card, Card Making, E-Z Runner Grand Dispenser, E-Z Runner Grand Permanent Strips Refill, E-Z Runner Permanent Fine, Foil, Linsey Rickett, Mixed Media, Wear Your Adhesive on the Outside. Bookmark the permalink.